Here is the YouTube of the lighting stream I did on Twitch. Hope this helps somebody! Beautiful. Once again, thanks for holding the stream! You guys are definitely showing other developers on how to involve their community, especially when you provide mod support, as always. Your beard is making me doubt my manhood. Thanks for the video oxy, very intresting stuff. Great stuff @oxygencube my man. It's official. @SgtRoss's beard has been dethroned! i second that Desmo.. Ross's beard is like a twilight serenade.. sweet but not the sunshine. You sir have a glorious beard. I noticed that he spent alot of time having to place the Sphere Reflection Capture Nodes in a grid all around the map (Not during the stream, but when working apparently). Would it be possible to write some piece of C++ code to do this automatically? But in all seriousness @oxygencube, the updated lighting is a breath of fresh air as a long time player. Simply beautiful stuff. Gonna make the feeling of playing the same maps over and over go away. Excited. Yea, I could prob come up with something in BP. I actually just copy/paste a set from another map. In the end, I still have to adjust most of them by hand to get optimum placement/height. Really doesn't take long tbh, not worth the R/D time to create the tool imho. This article can be helpfull as well. Oh man, thanks for the tut. I was like " yeah throw some lights in yeah looks good, I am done" Now I am like "..ehh ok delete all lights restart"
Some good news about lighting in upcoming UE 4.16. Epics has optimized DFAO, so it might return in squad in later releases. If you dont know what DFAO is, here is the link. Also I should say that lighting in open world games made on UE - is one of the major problems in my opinion. The second problem (and the most important) is perfomance and the absence of primitive methods of optimizing ordinary things, such as the absence of shadow lods. Yes, you can do shadow lods using blueprins (prefabs), but from the engine like UE4 I personally expected something built-in inside mesh import pipleline, the same way such as ordinary lods import for example. Also the overdraw budget is really low. Daedalus has started new series about lighting. @FishMan: that last one was interesting. i have one concern though, due to me believing that fully Dynamic lighting does not use Lightmaps. Why does he appear to discuss using lightmaps in the Dynamic section of that vid? Why does he appear to discuss using lightmaps in the Dynamic section of that vid? Hmm. Not sure that he did that and for obvious reasons I will not watch whole video from start. But anyway lightmaps are static, or at least stationary, cause you're still able to use dynamic lights in conjunction with static. And some games did it even for large environments. Im not 100% sure, but I think BF2 (PR) using lightmaps as the Heroes and Generals, where static shadows are replacing with dynamic shadow maps in close range. In Squad we still have shadows at close range. But at far there are no shadows at all and thats a shame. But its more a question of engine technology, UE4 is one of the worst engines for large environments with dynamic lighting. CryEngine is better. And here you can get a clue why. But still CryEngine is a giant nightmare in question of developing your own game especially a multiplayer game, so that is an obvious reason why devs picked UE4. 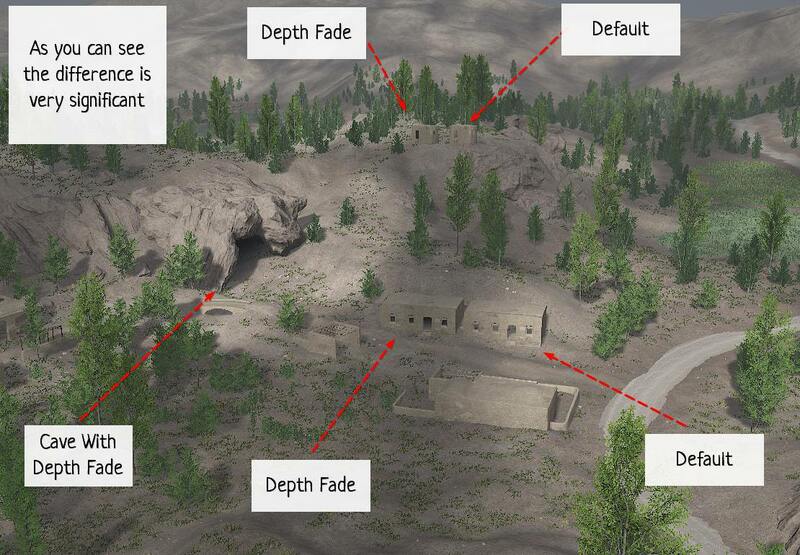 And yes, lightmaps have nothing to do with Squad, cause Squad uses dynamic lighting. Well this idea came to me rather long ago... But ... you know I'm lazy, I've said this a hundred times ... so I decided to do this thing just now. So here is small trick to improve your lighting and add some nice gamplay mechanic with just very simple shader. Surely everyone knows that the inner part of the building (or a cave) outside looks much darker from afar than near. So how to simulate that if we only have cascaded shadows and constant value for all dark areas? Well there is a solution: if we add some sort of the plane with depth fade shader in the portal area (door, window, cave entrance) we will be able to simulate this effect. And that is important - it's not going to disappear at the distance like shadow maps, so basically is what we get is another layer of depth in our lighting and a good gameplay mechanics (it will be harder to see someone inside the building outside from the distance like in real life. So people inside building will have an advantage like it supposed to).